What’s that sound?? Oh…it’s just our ovaries exploding into a bajillion pieces. [Click here] to watch the video. There are no words for these pictures. Not because we don’t know what to say–but because we are big piles of mush on the floor. We’ve melted. Is it just me or does he actually appear to be paying attention?? Who, by the looks of the pictures, had him wrapped around her little finger. *sigh* He’s a keeper, S! 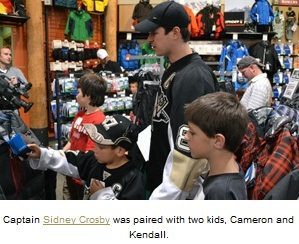 Sid, who is under a microscope with #CrosbyWatch right now, got DOUBLE the trouble being paired up with 2 kids. 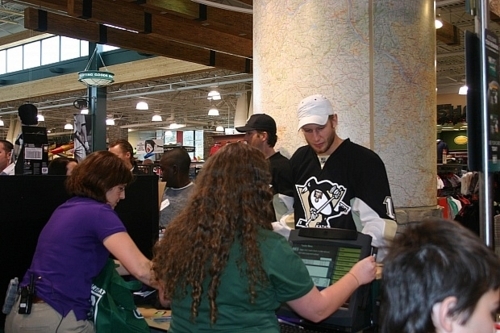 Anyway, still waiting for the Penguins to officially release the pictures on their website. 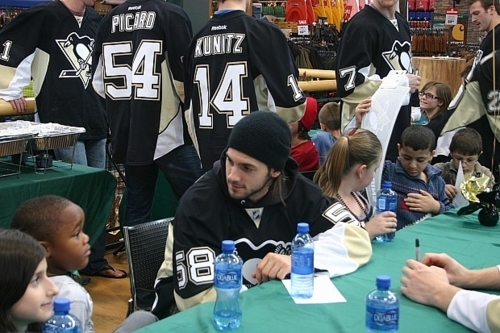 Tumblr is seriously lacking some James Neal action– and I for one would love to see him interact with some kids.